Well, Christmas is long gone, but if I had to do my gift giving over again these would certainly have been in the boxes. These almonds are seriously good. I know that because the first pound I made lasted almost 24 hours. At one point last weekend my daughters approached me and asked if they could take some to the neighbors. Of course I agreed, and they left with about a third of the pound. When they got home there was approximately six little lonely almonds left. You'll note that this recipe uses a seemingly strange ingredient, Bacon Salt. That's two recipes and two strange ingredients. I see a pattern developing here. In any event, this is a relatively new product. Put simply, it's bacon in a bottle. I'm fairly confident that you'll find all manner of uses for it once it's in your cupboard. The cool thing about this recipe is that you make it your own by the BBQ seasoning you choose. I used my mild rub, which is pretty sweet. If that's not your thing, kick it up with something spicier. I have tender tongues to contend with. If you're sitting there with that dog-that-just-heard-a-strange-noise look on your face because you don't have any BBQ seasoning, just make this, or if you're in a hurry simply substitute one tablespoon each of salt, chili powder and brown sugar. I'd throw in a little (1/4 teaspoon) each of onion and garlic powder as well, but I'm picky like that. You don't need the excuse of a holiday to make these. They are brain-dead easy, and still pretty good for you, despite the sweet and salty goodness that coats them. Let's all support our California almond growers and make a pound or six. Preheat your oven to 325*. Line a large sheet pan with parchment paper, overlapping all sides if possible. Mix all the dry ingredients, except the cayenne, in a small mixing bowl. Whisk the egg white, water and cayenne together in a medium mixing bowl until just frothy. Add the almonds to the egg mixture and stir well to coat. Reserve 1/4 cup of the dry mixture. Add all but the reserved dry mixture to the almonds and stir to coat well. Dump the coated nuts on the lined sheet pan and spread evenly. Try to get the almonds in a single layer, but it's OK if they are clumped a little. Bake on the middle rack for 15 minutes. Stir the nuts with an oiled silicone spatula. Make sure you keep them spread evenly. Stir the nuts with the oiled spatula and sprinkle evenly with the reserved dry mixture. Remove the nuts and stir periodically with the oiled spatula to separate them as they cool. Break up any large clusters. When cooled, store in a zip-top bag. agoodman - Just use half the cayenne and chipotle. Munching on these right now. They...are...Delicious!!! 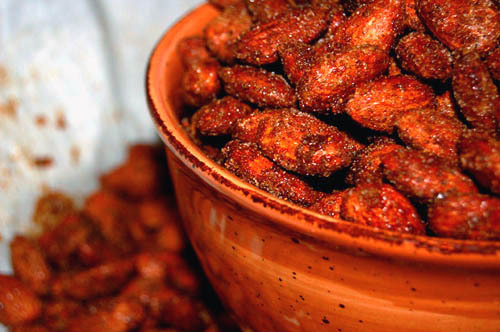 Crunchy sweet sugar with a spicy bacon-like twist, with a mild-spicy finish. Although, once they start cooling, have to work fairly fast to break them up, lest the melted sugar solidify. Certainly no reason to knock off a star. Managed to find Sweet Hungarian Paprika, but could not find Sweet (or Dulce) paprika. So I used "Fine" (Whatever that means) paprika. Also, as a dunce, novice cook, I misread the directions for the onion and garlic measurements (for the All-Purpose BBQ Rub) and used 2 Tbs of Garlic powder (could not find granulated) and 1 Tbs of Onion powder (again, could not find granulated...). Was afraid they'd be too garlicky, but no, they were not. To be honest, I don't think granulated or powdered makes any difference; at least with this almond recipe. Peanuts are very tasty made this way, though I had to reduce the baking times (at least in my wacky oven) by almost half. Yum! There just arent enough words to describe what a gem of a recipe this is! The men in my life (AND SOME OF THEIR WOMEN) cannot get enough of these. I need an almond tree...Im off to make yet another batch and give as a thank you gift. Receivers' generally think there is no finer "thank you" than this. What would be a good substitute for the sugar and brown sugar? Cant have sugar, and I'm not too concerned with sweetness, so I don't use artificial sweeteners. Thanks!